No real need for a wordy blog, just two really special 1970's chronographs by Mondia (above) and 'Chronographe' (below). Both with Valjoux caliber 7734 movements but even more interesting are the designs -- The Mondia with gradation turquoise blue center, graphic asymmetric registers and brushed steel case, the Chronographe with highly unusual tilted diamond shaped dial and cushion case. Both proud recipients of the Watchismo Seal of Approval. 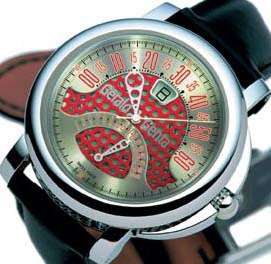 These two watches have some serious balls. 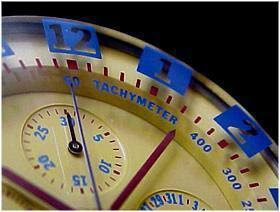 Vintage mystery dial watches often have inventive displays of timekeeping as do the 1940's Mido (above) and 1965 Gruen (below) which both feature floating balls for hands. 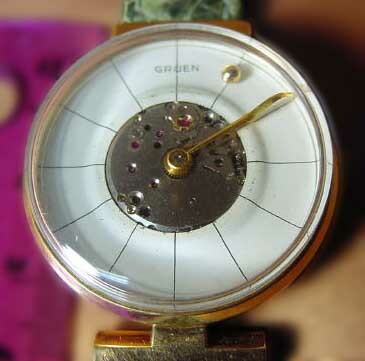 Attached to disks, the balls spin in a typical rotation but the solid 14k solid gold Gruen has a very unusual minute hook-hand that clears the little pearl hour orb with each passing. 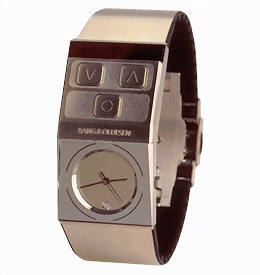 Top designer of Danish Hi-Fi at Bang & Olufsen since the late sixties, Jacob Jensen created the Beowatch (wristwatch & remote controller) for the Beocenter stereo system. 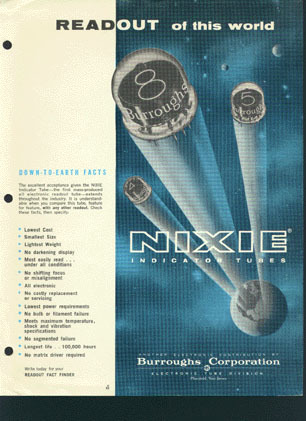 Incredibly scarce today as it appears to have been produced for a very short time. His sleek geometro-futuristic designs for B&O and his own company Jacob Jensen Design are part of the MOMA permanent collection in addition to his own solo exhibition. 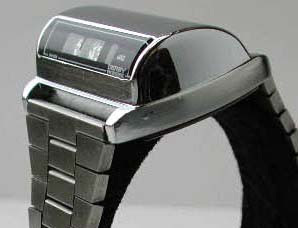 The Beowatch has angular curvexing that reminds me of the Sinclair Radio Watch. "The appearance of most audio equipment is seldom given thoughtful attention, and its impact on the domestic interior is frequently ignored. For this turntable, Jensen applied strict aesthetic criteria, emphasizing a horizontal profile and the clarity of basic geometric forms. Jensen, who has designed products for Bang & Olufsen since the late 1960s, dislikes conventional dials and knobs, and frequently reinvents the way in which controls appear and are used. His turntables are distinguished by an innovative use of a tone arm that moves tangentially, rather than diagonally, over the plane of the record." 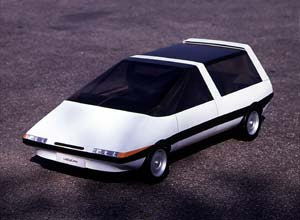 Jacob Jensen's 1984 Concept Automobile, the "Logicar"
In honor of the recent solar storm headed to earth, I'd like to remind y'all about the super mod Aurora Clock. 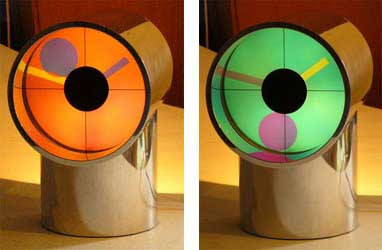 You might remember these Northern Light style clocks from the seventies with it's polarized color-shifting light show and rotating planetary seconds sphere inside a tubular polished aluminum case. Well, either way, Chrono Art is repairing old models and selling new & improved ones with brighter Super Flux variable spectrum LED lighting. 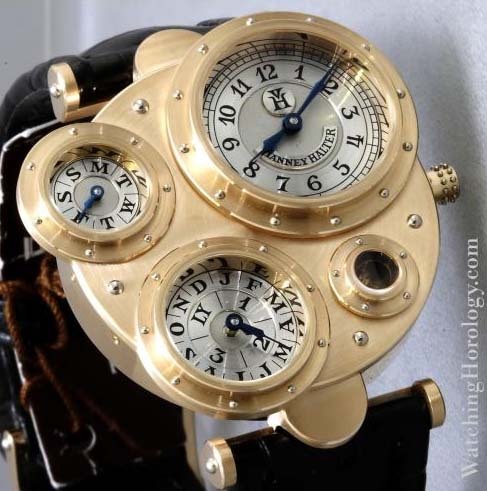 '20,000 Leagues Under Switzerland' starring Vianney Halter's Antiqua. A Nautilus-ish time machine complete with riveted portholes, perpetual calendar, 100-year accuracy and 900 hours of watchmaker sweat into each watch. 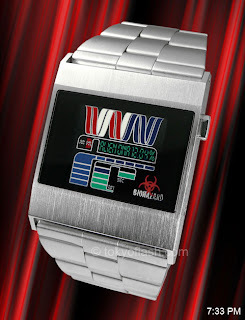 Like the receding ocean before a tsunami, this was the predecessor to a wave of innovative Swiss watchmakers to follow. Or if H.G. 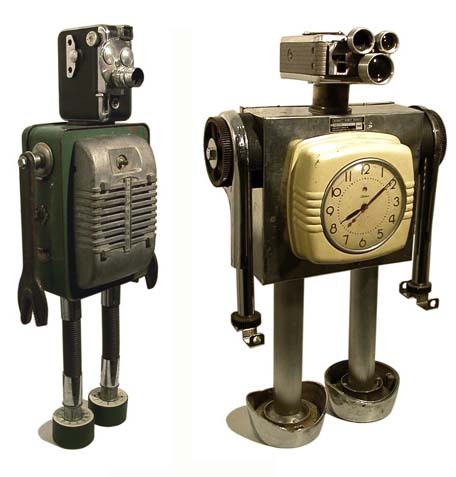 Wells scripted it -- Swiss Steampunk watchmakers of the future's past. 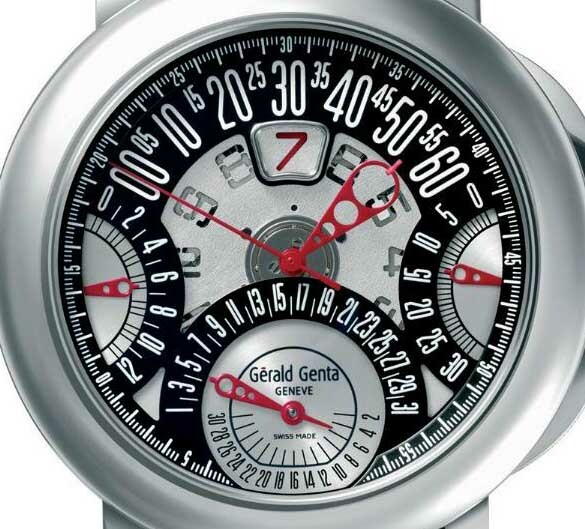 Gerald Genta creates amazing 'Wristboards' (dashboards for the wrist). 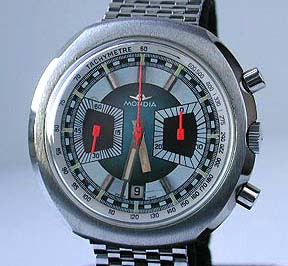 This multiplex of a watch is the Arena Chrono Quattro Retro, featuring four retrograde dials and a jump hour display. 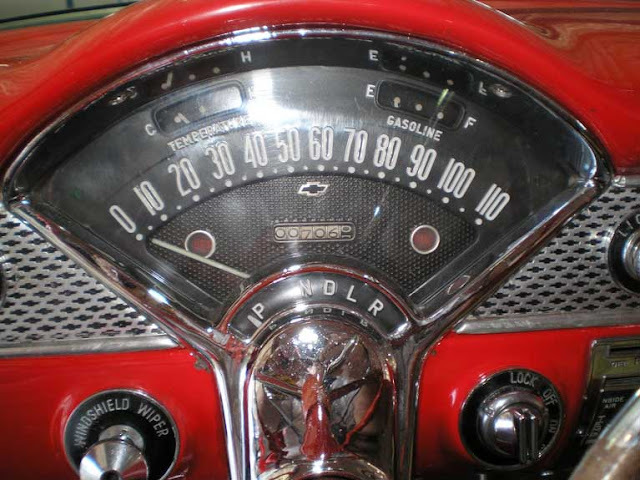 Priced around $25,000 (Genta price ranges from 5k - 250k), you might like to add the vintage Chevy featured below with similarly situated dash. Mike Libby found a dead beetle. 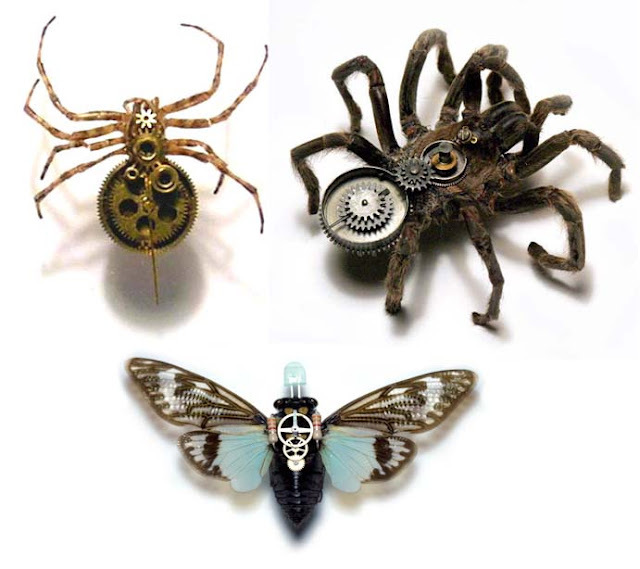 Upon closer examination, he recognized a connection between the invertebrate creatures and mechanical watches. 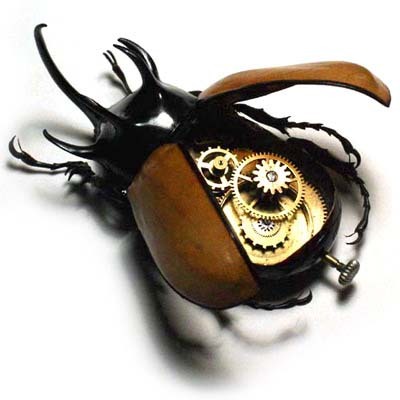 He now imports exotic specimens for dissection and artistic restructuring using antique balance wheels, mainsprings and other types of cogs for his Insect Lab. 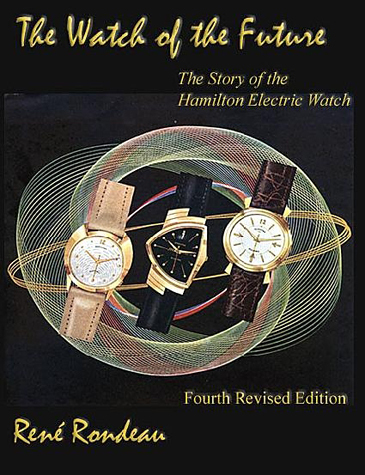 Pierre Balmain, a traditionally conservative French fashion designer, created an unconventional line of watches during 1971-73 -- most similar to the newfangled Pierre Cardin models of the same years. 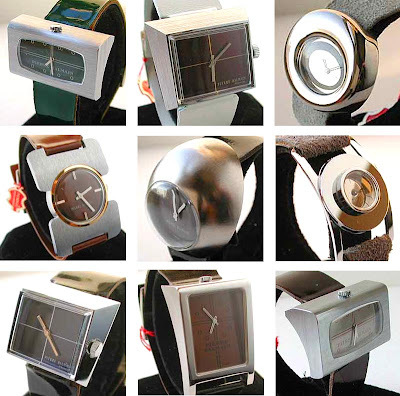 Minimalist domes, asymmetric wedges, chunky cubes, and panelled plates make up this unorthodox vintage series. Ettore Sottsass, Italian mid-century modern designer for Olivieti (typewriters), Alessi, Artemide, Knoll, and founder of the eighties Memphis Group. 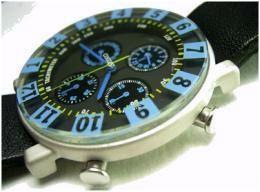 He was also an occasional watch designer for Tissot, Seiko, and the current Alessi line. 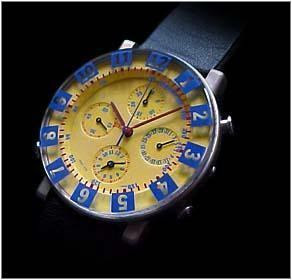 Shown here is a series of watches for the 'Seiko Sottsass Collection' featuring these rare colorful chronographs. The book that started it all for me. 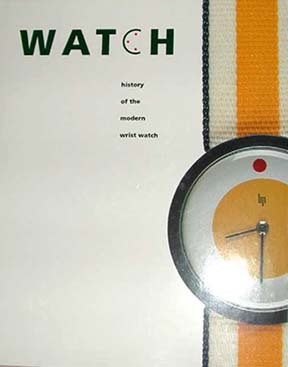 Pieter Doensen's highly influential 'Watch - History of the Modern Wristwatch,' showcasing innovative designs in relation to the technological advancements of the fifties through the eighties. 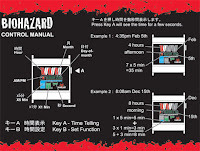 Out of print but can be ordered through Mr. Doensen himself here. Good thing my wife loves timepieces as much as I do. 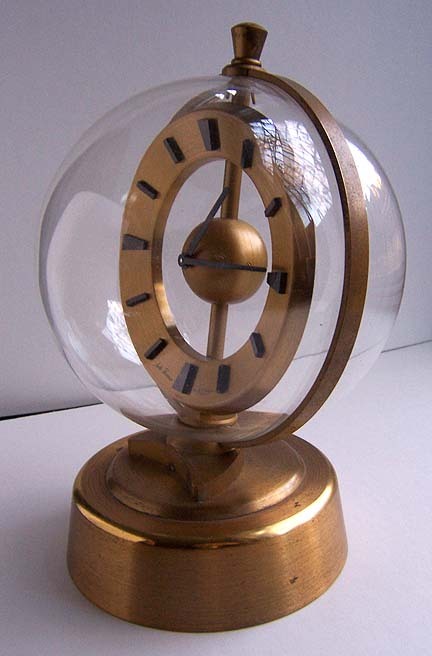 She agreed this space-age-deco globule of a clock would be an anniversary gift to ourselves. 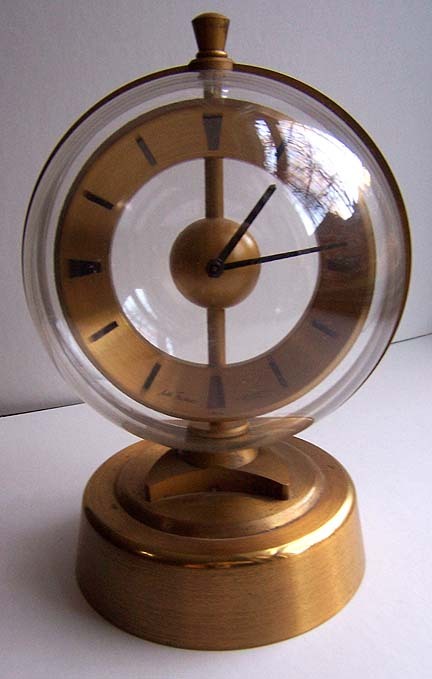 When I first showed her the Seth Thomas 'Sethosphere' mystery clock - movement hidden in brass base & mechanics leading through tube to center sphere - she belted out "We must have this!" Don't twist my arm lady. Fine. It's here, it's queer, get used to it. 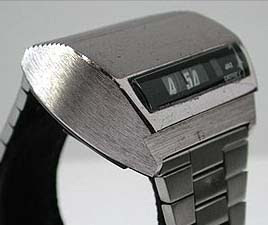 You think your digital watch is old? Try this antique sucker pushing 175 years. 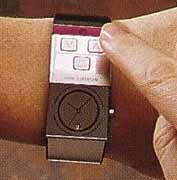 140 years earlier than what we commonly think of as the earliest digital watches. 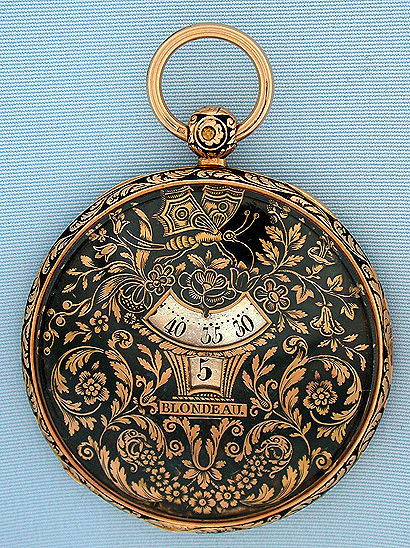 Circa 1830's French 18k champleve enamel jump hour digital pocket watch by Blondeau, watchmaker to the King. 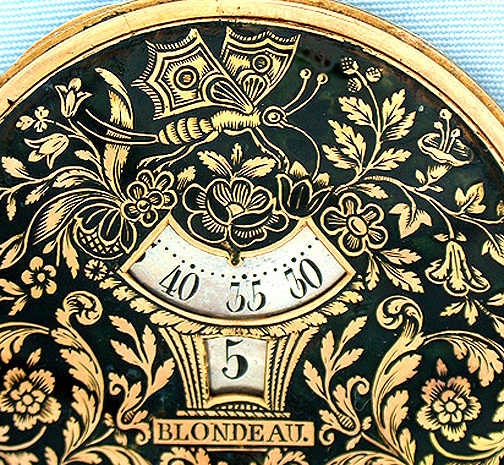 Close-up of the dial - engraved with bugs & birds! Bottom row - Blue blocks represent 5 minute increments, green are 1 minute each. 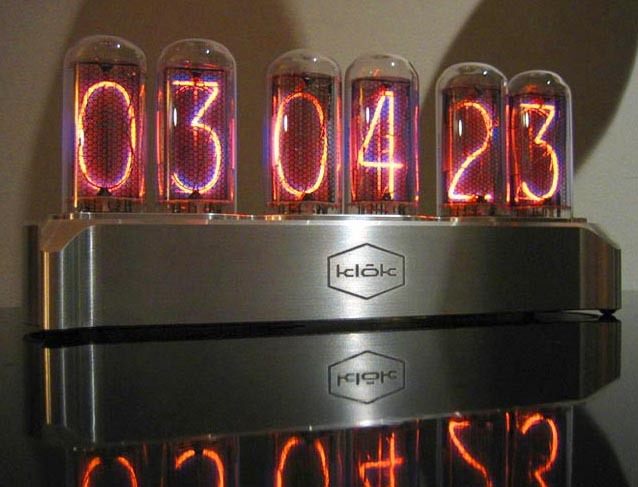 Well, it's 'Tube Week' at The Watchismo Times. 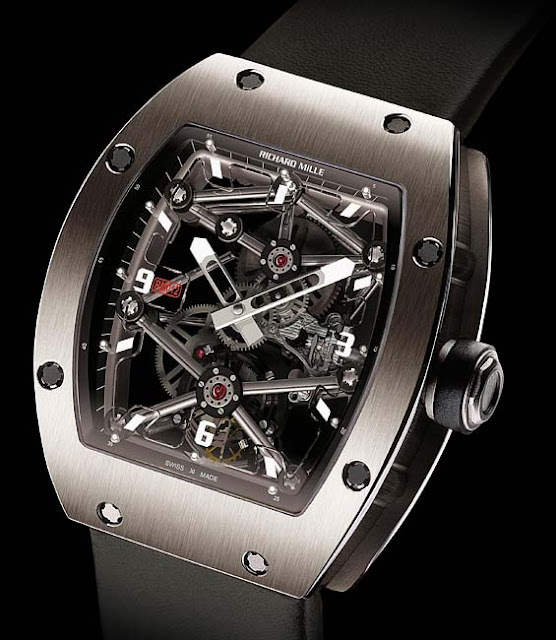 Featuring everything cylindrical, rolling, and tubular including this Rube Goldberg-esque mechanical masterpiece by Richard Mille. 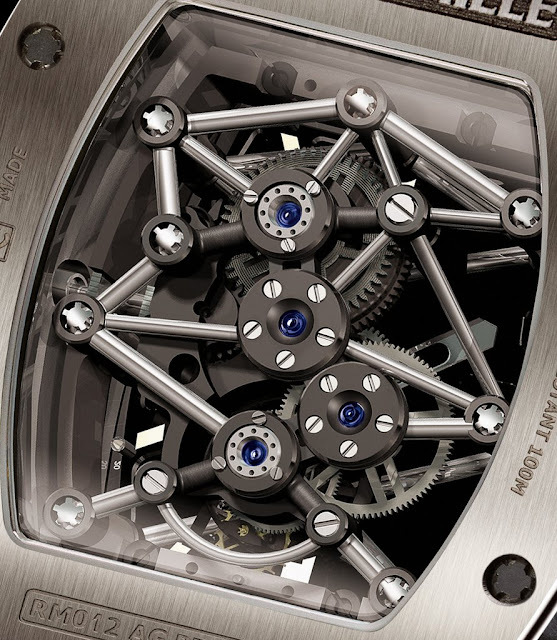 The '012' Tourbillon wristwatch is one of only 30 Platinum models made and features an architecturally engineered movement worthy of exhibition. 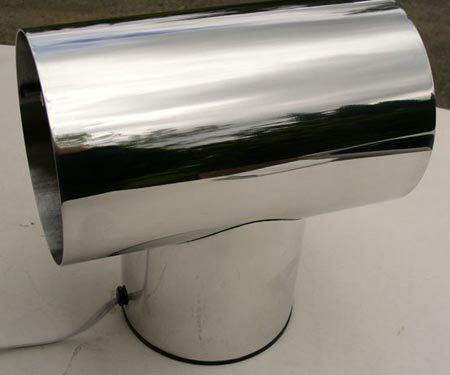 The aluminum alloy Anticorodal 100 (AlMgSi1) is normally used in industrial engineering applications such as skyscrapers, ships and sports cars and is composed of aluminum, magnesium and silicium. This particular alloy was selected for its combined qualities of low mass inertia, endurance and dynamic strength, the special ability to absorb vibrations and a high resistance to corrosion and wear." 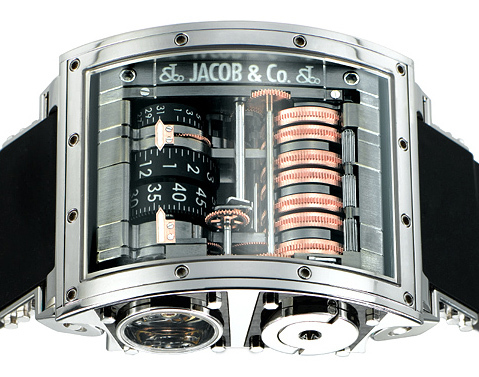 Jacob & Co.'s unexpected offering named the Quenttin - from their über 'Bling' watch line. 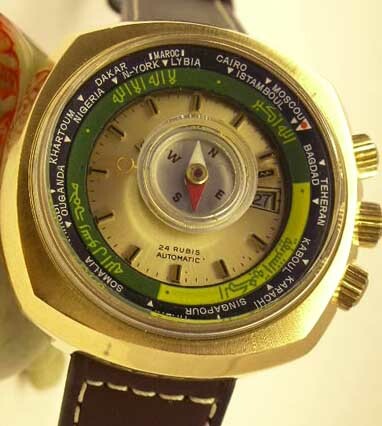 A 56mm vertical barreled wristwatch - competing aesthetically with the Cabestan, both with such limited production, there should be room for more roller wheel display watches and hopefully one that doesn't cost hundreds of thousands of dollars like these. The Jaz Derby first created this style with their Swissonic in 1974. 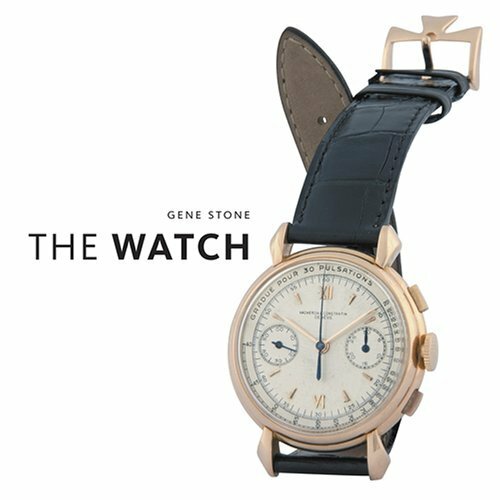 Built from either Magnesium, Rose Gold, White Gold or Platinum, fit with vertical mechanical movement wound by key, anchor mounted in Tourbillon cage & 31-day power reserve. 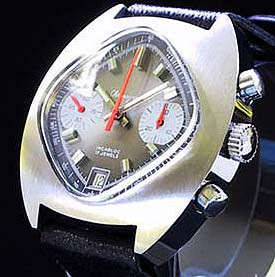 The Jaz Derby Swissonic, Introduced in 1974 at the Basel Fair (Annual Swiss Watch Trade Show), featured a fascinating new way to display time. Cylindrical barreled rolling wheels powered by a new transistorized system with balance by Dynotron, ESA 9176. 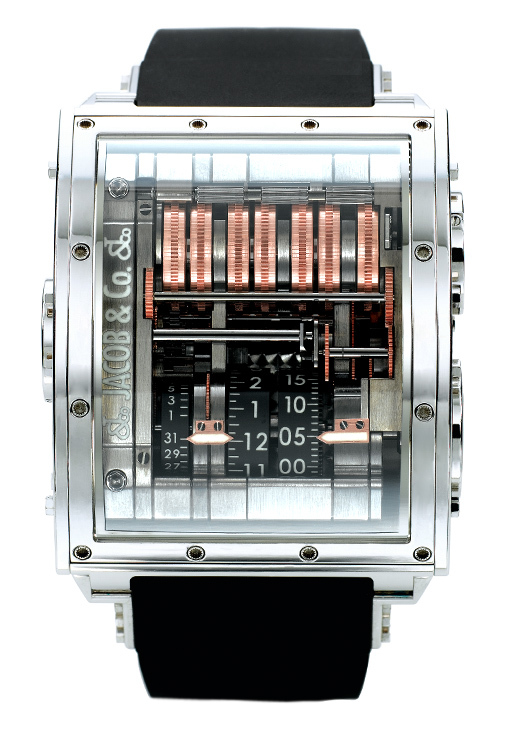 Rotating numbers on these drum rollers created a very tall timepiece sitting over 15mm off the wrist. 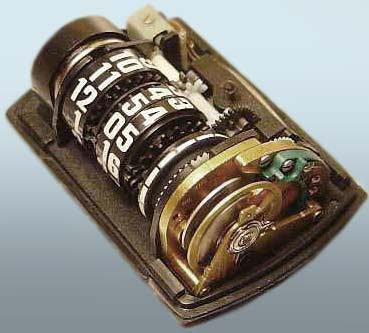 A wheel next to the digital readout had graduating sized lines (thin t0 thick) deliniating each minute passing before 'clicking' to the next. 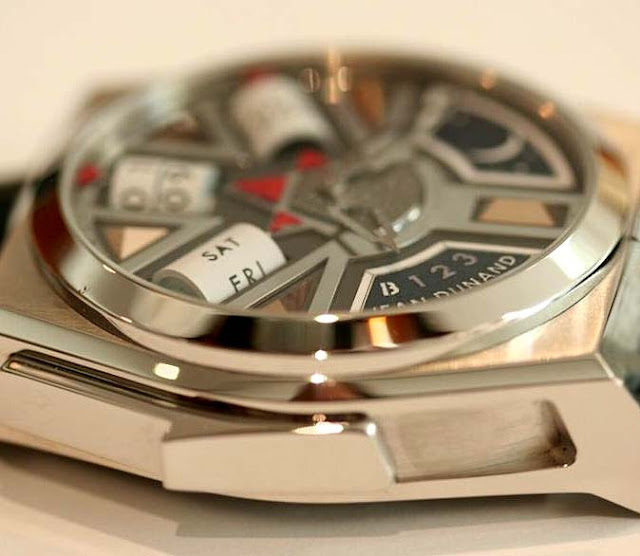 Many high-end watch companies today are creating roller style watches like Vianney Halter's Cabestan, Jean Dunand's Shabaka, and Jacob & Co.'s Quenttin. But the obscure French Jaz Derby started the ball, uh...wheels rolling. 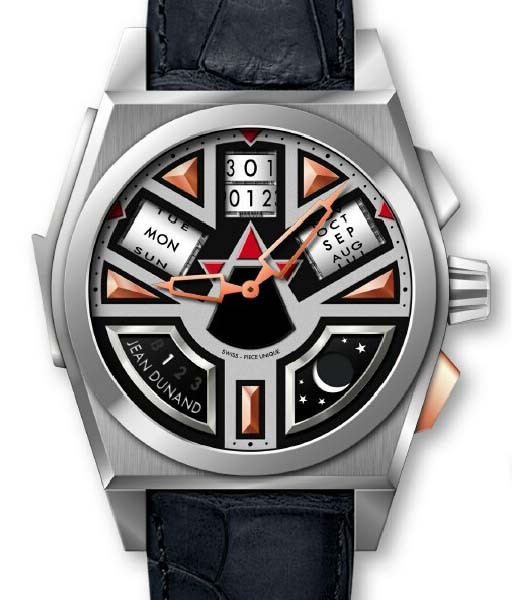 Four years in the making, new Swiss Watch company Jean Dunand has announced the 'Shabaka' release for 2007. 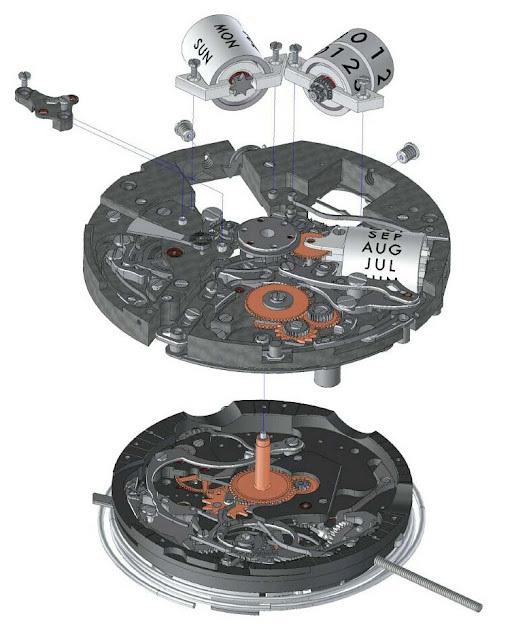 A minute repeater (chiming gongs), moonphase, leap year cycle, and best of all, instantaneous perpetual calendar with rollers for month, day of week and double-barreled day of month. Named after a Egyptian Pharaoh and modeled in an Art Deco Egyptian revival style, only twenty models a year are planned for production. 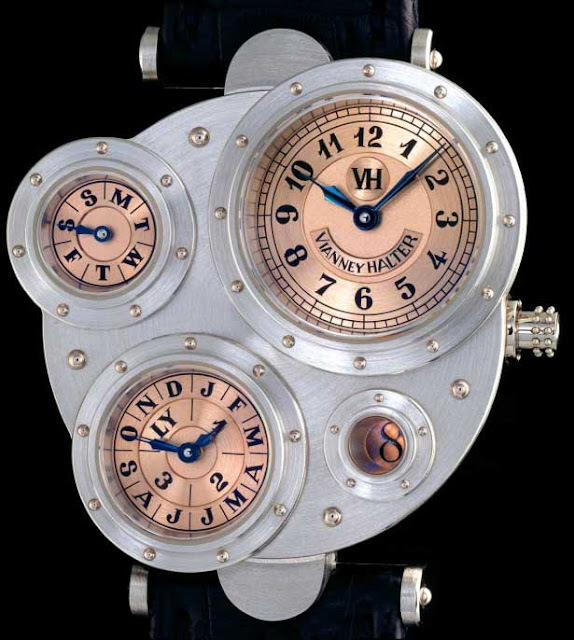 Named for Swiss Art Deco artist, Jean Dunand - by entrepreneur Thierry Oulevay (Tourbillon Orbital) and haute watchmaker Christophe Claret (Harry Winston Opus IV). 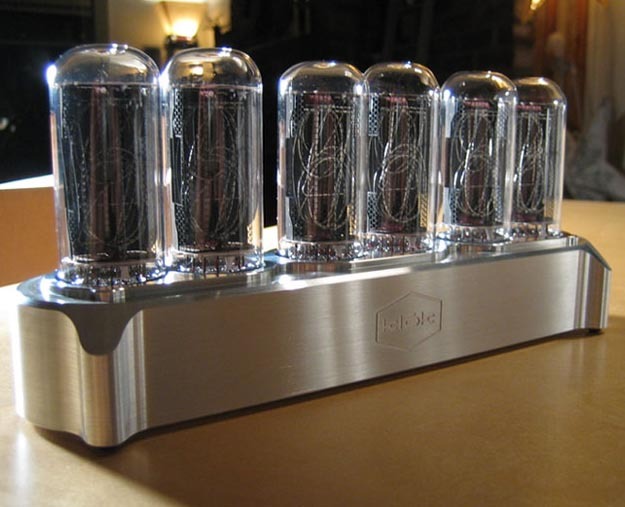 Vintage Nixie Tubes from the USSR are reclaimed after 30-60 years in Russian warehouses by Industrial Designer, Mike Mayberry and his company, Klok Modern. 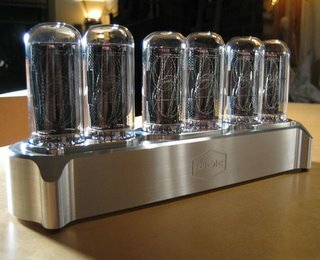 Exquisitely displayed in his custom fabricated, limited edition, aircraft aluminum housing and sold as a kit for home assembly. The beauty of the ten layered electrodes glowing orange with overlapping dimension can only be appreciated when it's right in front of you.